Note: Power Map, our popular 3-D geospatial visualization add-in for Excel 2013, is now fully integrated into Excel. We’ve also given this feature a more descriptive name, “3D Maps". You'll find this functionality alongside other visualization features on the Insert tab. Microsoft 3D Maps for Excel is a three-dimensional (3-D) data visualization tool that lets you look at information in new ways. 3D Maps lets you discover insights you might not see in traditional two-dimensional (2-D) tables and charts. Map data Plot more than a million rows of data visually on Bing maps in 3-D format from an Excel table or Data Model in Excel. Discover insights Gain new understandings by viewing your data in geographic space and seeing time-stamped data change over time. Share stories Capture screenshots and build cinematic, guided video tours you can share broadly, engaging audiences like never before. Or export tours to video and share them that way as well. You’ll find the 3D Map button in the Tours group, on the Insert tab of the Excel ribbon, as shown in this picture. In Excel, open a workbook that has the table or Data Model data you want to explore in 3D Maps. For information about using your own data, see Prepare your data for 3D Maps. If you don’t have data to explore yet, try downloading one of our sample data workbooks. Click Insert > 3D Map. 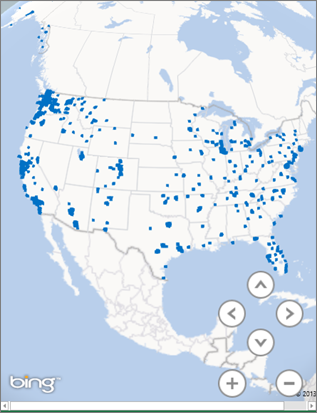 3D Maps uses Bing to geocode your data based on its geographic properties. After a few seconds, the globe will appear next to the first screen of the Layer Pane. 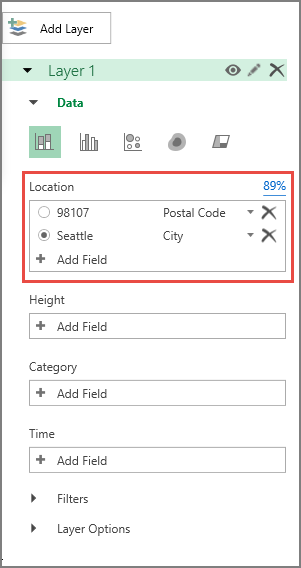 In the Layer Pane, verify that fields are mapped correctly and click the drop-down arrow of any incorrectly mapped fields to match them to the right geographic properties. For example, make sure that Seattle is recognized as a City in the drop-down box. 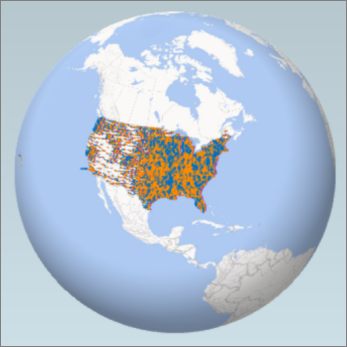 When 3D Maps plots the data, dots appear on the globe.